Updated: Is this the coolest ever mobile phone? 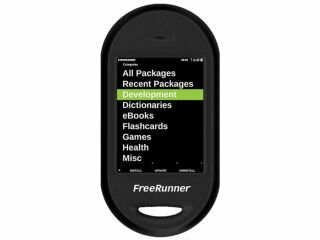 Only five months late, the Taiwan-based group has polished off its ‘freed phone’ development hardware and software to bring consumers the Neo Freerunner, a successor to the Neo 1973. The phone, which should be available to purchase direct from the company within six months, runs OpenMoko Linux on the Neo hardware platform. Unlike any other phone, both hardware and software are entirely open source. Aside from the usual licence to alter and distribute the Linux operating system, the hardware is transparent too. OpenMoko has even published full blueprints, including CAD diagrams from the design stage of the components. As for what that hardware can do, there’s a tri-band GSM radio, a 640 x 480 touchscreen, Wi-Fi, GPS, a 400MHz CPU and a USB host port for attaching peripherals. We reckon phone geeks and ordinary users alike should be salivating at the prospect of getting their hands on a piece of kit that makes the iPhone look like a toy. We’ll bring you word on pricing and availability when OpenMoko confirms it for us later today. Update: Sean Moss Pultz of OpenMoko just confirmed that sales will start in the second half of this year. They'll be only at OpenMoko.com and the Neo Freerunner will cost a reasonable $399 (£198).